Chabad's non-judgmental approach to learning has made us the address for Adult Education to Jews from all walks of life. Participants in our adult education programs are affiliated with institutions spanning the spectrum of the Augusta community. The following is a list of our current offerings. Be sure to check the calendar to be sure that classes are held. All classes are currently held at our Old Furys Ferry location. Sunday evening Weekly Talmud Study at 7:45 pm. 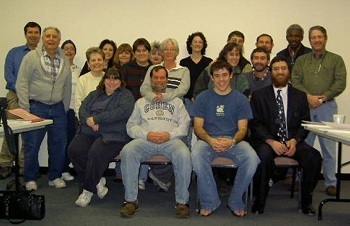 This class studied Talmud from Hebrew / English books. It’s good to have a little background in Jewish studying to appreciate this class. Wednesday evening Torah Studies, at 7:30 pm (Study material is from the renowned Jewish Learning Institute). Click here for more information. This class is offered in seasons. Each season is about 12 weeks. Click here to see if we’re in season and studying now. No learning / knowledge background is needed to fully appreciate this courses offering. For some classes it may be useful to have background knowledge and some may also have a nominal book fee. Call Rabbi Fischer to get more information if a particular class would be beneficial to you. 706.722.7659. Be sure to check out www.chabad.org – a great resource in Jewish learning. It's always a good idea to call ahead to make sure no last minute changes were made.